On February 23 Jeison Rosario of Miami, FL by way of Santo Domingo, Dominican Republic, defeated Marcos Hernandez of Fresno, CA with a 9th round TKO at the Minneapolis Armory. Just like last August, Rosario turned in the finest technical performance of the night, delighting fans there to see Anthony Dirrell regain the IBF supermiddleweight title and Jamal James continue his charge to a welterweight title shot. Rosario, improving to 18-1-1 (13 KOs) and Hernandez, falling to 13-2-1 (3 KOs) opened their fight with a close round. Hernandez circled well with jabs and follow up punches in the first, Rosario eventually catching him and landing good body shots on the ropes and following up with head shots at the end of the round. Rosario was particularly impressive in his head movement, especially in his ability to draw missed punches from Hernandez and counter him with combinations. He continued this in the second round, also coming over Hernandez’s jab with the right hand and at times drilled the straight right to the body. Rosario picked up the pace in round three and dominated it in the same way, seeming to land harder combinations, although Hernandez did score towards the end of the round and keep the fight very competitive. In the 4th round, Rosario continued down the same path, Hernandez landing some left hooks near the end of the round to stay in it but visibly fatiguing. The one punch both seemed to be able to land through the first five is the left hook, although Rosario had the advantage overall throughout. While Hernandez was still fatigued at the end of the 6th, for the first time Rosario began looking a little tired. In the 8th round, while continuing his pressing attack, Rosario slipped expertly while punching and also rolled well with Hernandez’s punches, reminiscent of the expert head movement of the great Wilfred Benitez. Continuing his onslaught in the 9th, Rosario backed Hernandez into the ropes and landed a right hand followed by a picture-perfect left hook that knocked Hernandez down, onto his back. 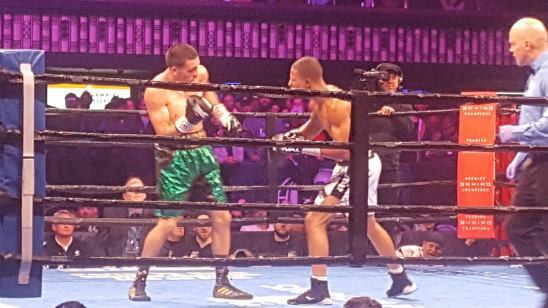 Although Hernandez was able to beat the count, he was unable to hold off the continued Rosario attack to the referee’s satisfaction and was stopped on his feet. The TKO came officially at 2:45 of the 9th round. Rosario’s next fight will be April 20 in Carson, CA against Jorge Cota, 28-2 (25 KOs) of Mexico. Cota is sure to be a tough opponent, but with his current momentum, one can’t help but believe Rosario’s chances to be very good. Hopefully we’ll see him back at the Minneapolis Armory before the summer is over.